Manager: Have you finished the set for the $10 price point? Junior designer: Er, no, sorry, I've been too busy adding superfluous functions to the tracked loader. 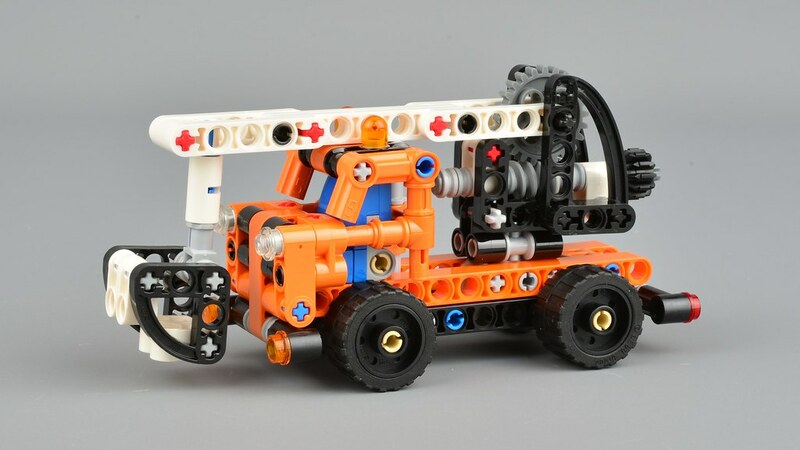 It's identical in design to 42031 Cherry Picker released in 2015. I don't have the old version so didn't know until I looked back through the database here at Brickset after building it. To be fair, it does look much better in the more consistently applied orange and white livery and it contains quite a few re-coloured parts, although it's possible some are also used in the orange 42093 Chevrolet Corvette ZR1. It's a decent enough set for its size, I suppose, and it does offer a good introduction to worm gears. I'm not sure it warrants a re-release, though. Quite a few Technic sets have been re-issued a second, or even a third time in the past, but I think this is the first example of one that has been entirely re-coloured, but correct me if I'm wrong. So from that point of view it's quite interesting. When released just after Christmas it will cost £8.99 and $9.99, which is just £1 more than 42031 was in the UK and, incredibly, $3 cheaper than it was in the US! Strange pick for a re-release, although I got to say the orange really is a more attractive color than the original set. I must say that this new color scheme is way better. I would buy it now. This is like the Lego equivalent of a bad sonic fan-character recolour, except in this case the recolour is actually miles better than the original colour scheme...! In all honesty though, it's a technic set so my opinion on the subject mainly boils down to "eh, don't really care" innit. Too busy gushing over the neat TLM2 stuff to be bothered by a ten quid set from a theme I don't collect. I am not a technic guy, but am all in favor of price drops!!! My minifigures wouldn’t pick cherries with this one. Maybe my micro technic figures. But then again they like apples better. And if someone says that you don’t pick cherries with a cherry picker I’m going to call them a liar. 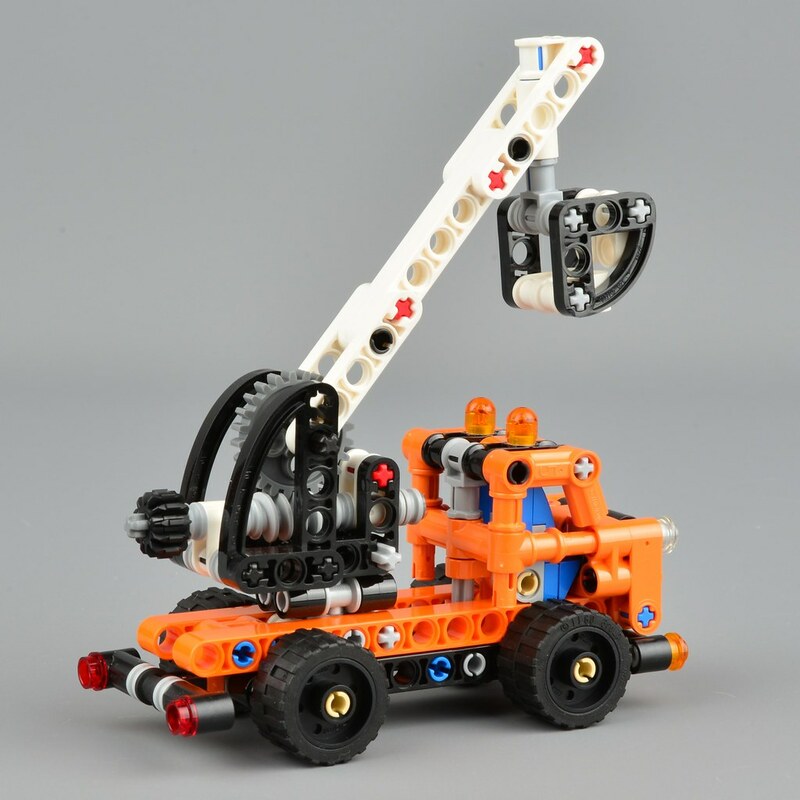 I like the initial released color scheme of this model better because it reminded me of one of the greatest Technic Sets ever: 8868 - Air Tech Claw Rig. 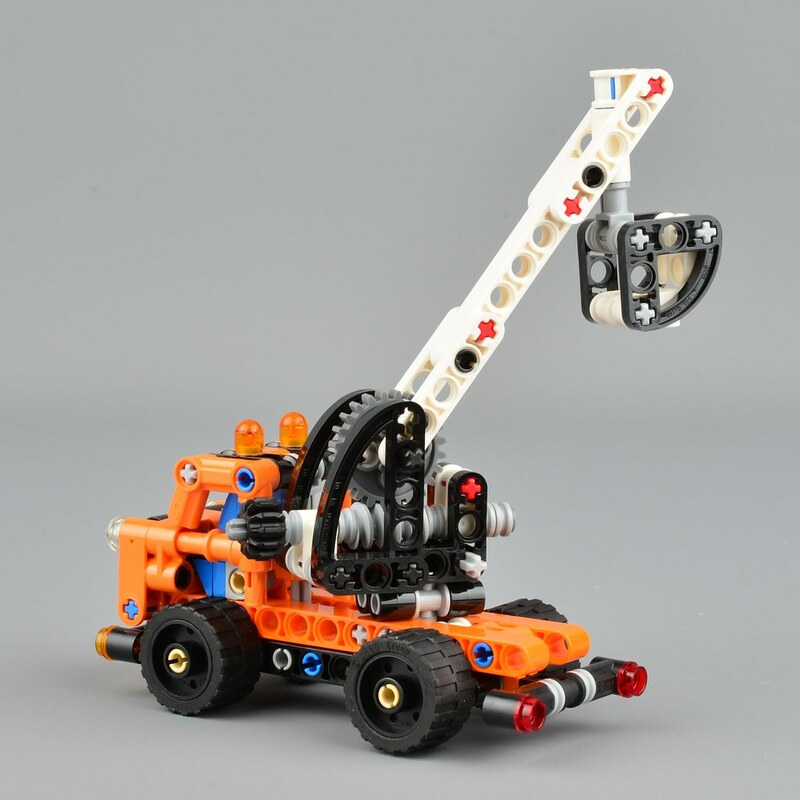 Speaking of re-releases, how about TLG thinks of re-releasing classic old Technic Sets like 8868 or 8880 with newest parts? 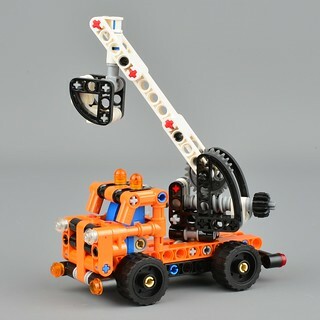 Or will Technic become just a bunch of overpriced licensed sets with few functions and tons of stickers? They're really not cherry-picking these re-releases. A few Lepin guys slipped into the design team. I don't have the original and have only just got into Technic so I will probably get this when the price hits £6.99 or less. Lego is just getting lazy, very very lazy. I feel they should stick with construction vehicles as they have so many more functions than the standard steering, drive train and piston engine in every car they make. I'm always intrigued as to what they will come up with each year. This 2019 first wave is barely acceptable in my eyes except for the RC which is cool. ^ And once Amazon puts the usual 20% discount, it's suddenly 38.5% off the previous version's MSRP! As you can see, there has been quite a lot of re-issues over the years. This list includes early EU/US set number duplicates, as well as a few obvious 'recolours'. But the early 2000's was definitely when they really started taking sets from 5-6 years prior, and just re-issuing. Cherries? I like oranges. Get it? I got the Porsche, probably getting the Vette. This might just be something for some extra parts in orange color. Considering how much the 2015 version is going for on eBay (I saw upwards of 50 quid following the link from Brickset), a reissue seems worthwhile for people who missed it the first time and aren't aware of Bricklink. "But the early 2000's was definitely when they really started taking sets from 5-6 years prior, and just re-issuing." This is interesting. They seem to be following their "rough patch" pattern from 18 years ago almost perfectly. Based on this, we can expect to start seeing good new sets again in another 2 years or so, once they correlate their sales figures with the design direction and take corrective action (hire AFOL designers?). @DrFrankenstein: I don't really understand what you mean about good new sets. Today's new Lego is awesome overall, with just a few sets that are divisive at worst (which is inevitable at the best of times). Reviews back this up. A far cry from their "rough patch" around circa 1999-2004. I bet the designer was lazy and just copied an old set hoping management didn't notice. And it worked! Much prefer the old colour scheme. Don't like the orange colour anyway. Unless of course they decide to do a Technic trash lorry one day (which over here generally used to be orange or silver-with-orange most of the time in the past. Nowadays it's "anything goes").